Mankazana Safaris is situated in the Mankazana Valley, approximately two and a half hours by road, north of Port Elizabeth, near the town of Adelaide, in the Eastern Cape Province of South Africa. The area is extremely game rich and forms the geographical core of an internationally renowned safari industry, offering arguably some of the finest plains game hunting anywhere in the world today. 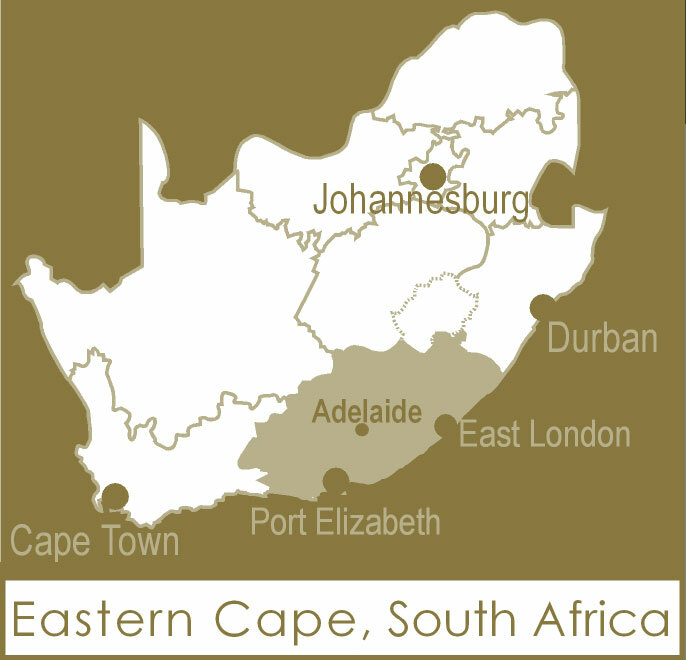 Topographically, the region is dominated by the Winterberg Mountains, which rise to over 7700ft above sea level, forming a barrier to the moisture laden winds blowing from the coast. Arising in this mountain range, the Mankazana River meanders through this mountainous wilderness, creating a mixed terrain of deep ravines, thickly wooded slopes and undulating country between the mountain ridges. South of the town of Adelaide, the foothills of the Winterberg give way to more gentle country, comprising small hills, separated by dry river courses and lightly wooded savannah grasslands. Climatically, the region is a convergence zone for warm, moist, subtropical air from the north, cooler, southern coastal winds and also the drier, hotter winds which originate in the arid interior of the country. Although this convergence can sometimes lead to diverse weather conditions, the general climate in the Mankazana Valley is temperate, with no unpleasant excesses of heat, cold or humidity, for most of the year. The best months for hunting are from March to September, during which time the average daily temperatures range between 15 – 20 degrees Celsius. Snowfalls are relatively common on the high lying areas during winter, and evening or early morning temperatures often drop below freezing. The region receives the majority of it's rainfall, in the form of thunderstorms, during November to February, although cold fronts, originating in the cold, Antarctic Ocean, accompanied by light to moderate rainfalls, are not uncommon during May – August. This climatic variation, in turn, leads to a wide array of plant and animal communities and visitors can expect to hunt in indigenous montane forests, dense valley bushveld, savannah grassland, semi arid shrubland and riverine thickets. With over thirty species of antelope, pig, predator and primate occurring within the Mankazana Valley and surrounds, this region offers the discerning sportsman and woman an unparalleled safari destination.